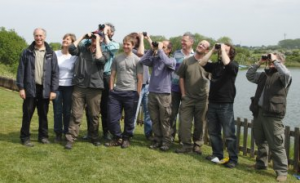 Ely Wildspace bird race: How many bird species can be seen around Ely in a single morning? That is what more than twenty members of Ely Wildspace tried to find out on Saturday when they took part in Ely’s first ever ‘bird race’. Five teams, each led by an experienced local birdwatcher, set out at 6am and explored every corner of the Wildspace, trying to see or hear as many bird species as possible before 11am. The winning team, led by Duncan Poyser, managed to find an incredible 79 species, and in total a truly staggering 88 species were recorded. To put this into perspective, that is more than one could expect to find during a morning spent on some of the country’s finest nature reserves! The list included scarce visitors such as Black Tern, and rare breeders like Nightingale, Grasshopper Warbler and Turtle Dove. Most people encountered species that they had never seen before and, more importantly, learnt more about their local area and its fantastic wildlife. This was a hugely enjoyable event for everyone involved, and really demonstrates the incredible diversity of wildlife we have living on our doorsteps. How many bird species can be seen around Ely in a single morning? If you want to find out for yourself, or simply fancy a guided birdwatching walk around the fantastic wildlife areas right on our doorstep, then why not join the Ely Wildspace Bird Race on Saturday 7 May? We are meeting at 6am sharp at Ely Sailing Club where we will divide up into small teams, each of which will be led by an experienced local birdwatcher. The teams will then set off and walk all around the Wildspace trying to see and hear as many bird species as possible. We will return to the Sailing Club at around 11 to compare notes, discover the winning team and enjoy a barbecue in front of Roswell Pit! The event is free and everyone is welcome. Please bring binoculars (if you have them), warm and waterproof clothing and plenty of food and drink.